In part 1 of this five-part series, I explained how health care uses three inter-relating biases to control the dialog in health so that it’s aligned with its ideology and commercial aims, and how that restricts our discourse about the future of health and the role of the health ecosystem. Plagued by our collective inability to have a proper conversation about health, I went in search of a new conversation, one that made no assumptions as to what health is. I started by making myself read for two months. I remember telling a colleague I was going to do that and she described it as “indulgent”. I had two reactions. The first was to shake my head at people’s unwillingness to make time to read and think. The second, however, was a sense of guilt for being indulgent! This tension between the desire to think and the need to be doing something has never left me, and I feel it even now in writing this series. Of the many things that I read over those two months one that really influenced my thinking was a report by WHO’s Regional Office for Europe entitled, Is social capital good for health? It was the first time I’d seen what I considered to be ‘hard evidence’ that something social, not bio-medical, mattered to health. Social capital is essentially trust and a belief in reciprocity and cooperation. The authors found a strong causal relationship between social capital between individuals and their health. Given the strength of this evidence I couldn’t understand why it was not part of the discourse on the future of health, at least not the parts of it that I was aware of. To help shine a light on it (and other related research), I launched my work under the name of ‘Wellthcare’, ‘wellth’ being a synonym for the value of community. I felt that a made-up name would give me the freedom to explore the topic without being tethered to existing terms and debates. As with most decisions I’ve made in this work, it was good and bad. It was good because it enabled me to generate an audience – people are attracted to new things, especially in health where so much of what we have isn’t working. It was bad, however, because I was accused of dressing up people’s work as my own by presenting it under a new name. It was also bad because some people who were new to that work simply assumed it to be ‘smoke and mirrors’ because of the made-up name. I don’t regret using ‘Wellthcare’ and I think we did some good work. However, I learnt an important lesson – in a world of over 30,000 bio-medical journals and hundreds, perhaps thousands, of think tanks churning out reports, it’s impossible to have anything new to say. And saying anything without due attribution to previous work comes across as arrogant, ignorant or both. I shifted the work under my own name and, in parallel, realized that while I thought I was looking for a ‘new’ dialog, what I was really doing was finding something that was new to me. There were already practitioners out there working out how to enhance trust, reciprocity and cooperation within communities as a pathway to improve lives, including health. It was just that people like me didn’t know about them. So, rather than try to create a new conversation I realized the challenge was to facilitate the one that was already going on in a way that would help it penetrate the health ecosystem. I spent time with these practitioners in a number of ways: in person, through phone conversations, through highly-curated meetings that I held in New York, and by asking them to write about their work, such as for our eBook, Communities Creating Health. I started to hear recurring themes. Over time, I became more proactive in eliciting these themes by asking the practitioners what their three biggest struggles were. Those recurring themes are what we now call the 12 Principles (and the people that I learned from we collectively call the Creating Health Collaborative, although we don’t do much to aid their collaboration other than the occasional e-introduction). Rather than present the themes as struggles, I flipped them so they became considerations – things that other practitioners might want to consider in their work. Of late, I have heard people call the principles a ‘framework’. I have to admit that I always had an ulterior motive in all this. As I learnt more and more about the importance of trust, reciprocity and cooperation to health, I felt frustrated that health care seemed to see community-building work as ‘fluffy’. What health care means is that because it’s difficult to establish direct causality between an action and a change the work is too imprecise to invest in. The ultimate method for establishing causality is considered to be a randomized, controlled trial (RCT). The problem is that for an RCT to establish causality it has to remove anything that might muddy the analysis. These are called confounders. Removing confounders is something you can do in experimental conditions but it’s impossible to do in a community setting. 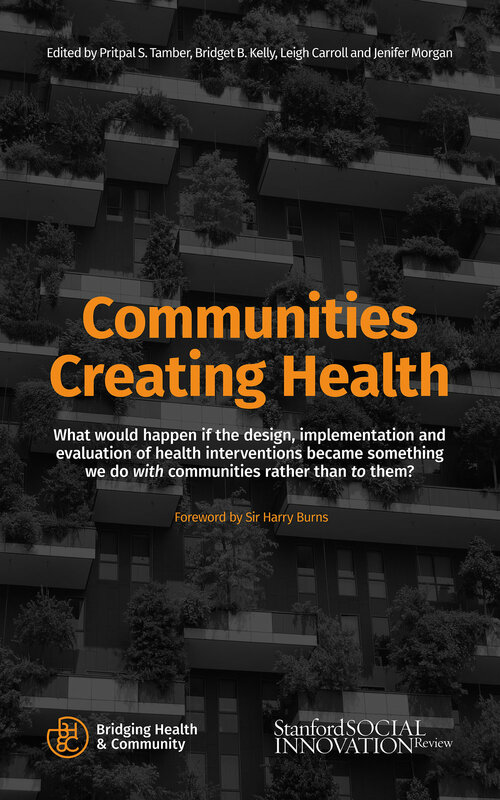 All in all, it felt to me as though health care was looking down on community-building work because it had not established direct causality – even though the idea of 'direct causality' made no sense and, even if it did, the method for establishing it was completely inappropriate. The RCT is defined by a 25-part checklist called the CONSORT Statement. It was put together by a group of researchers and journal editors who shared their experience of conducting the trials and reviewing their write-ups. I wanted to create something similar for community-building work to help give it shape. To my mind, with shape comes clarity and with clarity comes the opportunity to compare work in one place with another – a key tenet of research. In essence, I wanted to ‘de-fluff’ community-building work – at least in the eyes of those in health care. It’s taken years to establish the 12 Principles and I’m keen for them to evolve as we learn more and more about the practicalities of doing the work. But as they emerged I needed to understand why they were the considerations for community-building work. In part 3 of this five-part series I’ll describe how I understood the Principles within the context of agency and control, and how these things are fundamental to the future of health.